What a remarkable difference there is between win-win Lean management and win-lose conventional management. The former being a significant challenge worthy of the CEOs position, pay, and responsibilities, while the latter is unsophisticated and effortless. Leaders skilled in conventional management think they respect people and say things like: “That’s a given; we do it every day” or “You can’t be in business today without respecting people.” These words show little actual thought goes into understanding what is respect and who are people. The context is employees and respect is limited fundamentals such as courtesy, listening, and perhaps developing people – none of which is done well. Blame and many other forms of disrespect to employees and other stakeholders remain widespread. Their definition of respecting people is simplistic and weak, and it is largely ineffective because zero-sum management practice obstructs one’s ability to respect people. My work has focused on Lean leadership and the “Respect for People” principle for more than 20 years. However, I never thought to provide a definition to my students or anyone else. Why? It is because “Respect for People” defies simple definition. Anyone who has a lot of experience with Lean management (as defined above) knows that. A simple definition cannot fully capture its meaning. However, one does have to understand that “People” is not just employees. It is all stakeholders – employees, suppliers, customers, investors, communities, and competitors – and hence humanity. While a simple definition, such as that found in a dictionary, is what people want – customer demand – providing it will do more harm than good. Defining “Respect for People” fools people into thinking they know what it means. Similarly, defining the “Continuous Improvement” principle will lead to trouble. Simple definitions allow people to become lazy and avoid thinking for themselves. Defining the “Respect for People” principle puts people on the path of limiting their understanding of what it means. 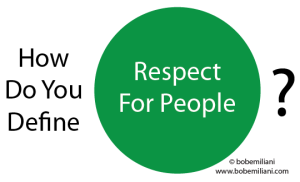 It closes people off to hundreds, if not thousands of different ways to understand “Respect for People.” My REAL LEAN books series is really an exploration of the many ways the “Respect for People” principle can be understood. So, instead of providing my students with a simple definition, I teach them who “People” are (stakeholders) and the many many ways in which the “Respect for People” principle functions. By doing this, I provide them with broad knowledge of how the principle applies to different stakeholders under different conditions. They are taught to comprehend the “Respect for People” principle within the far-reaching and ever-changing context of the real world, not within the limiting framework of a few words or a paragraph printed on a page. Toyota did not define “Respect for People” in a simple linear way, a few words or paragraph on a page. Instead, they provided boundaries that delineate a space or volume of how the “Respect for People” principle functions under different conditions. They did this by providing explanations of key concepts combined with many historical examples of Toyota managers who successfully put the principle into actual practice. Therefore, The Toyota Way and its principles, “Continuous Improvement” and “Respect for People,” are positioned as something that is not static but must instead evolve and develop over time. The “Respect for People” principle is comprehended only through daily practice, on the job, and in combination with the “Continuous Improvement” principle. It requires years of thought to understand well. And, it can never be completely comprehended. So, when you see or hear the “Respect for People” principle defined in a few words or paragraph, you are wise to ignore it (for example, when “People” is presented narrowly as only employees) or recognize it as just one of many many ways to understand “Respect for People.” As with anything pertaining to Lean management, it is best to think for yourself. Your definition of Lean management left me wondering something: Where is respect for people in it? Why would respect for people logically follow from the definition of Lean management as you state it in the opening paragraph of this post? I have for a long time approached Lean from a bit different angle. I’m not sure how to reconcile it with your definition, but I will try to describe it briefly. For me, Lean is first and foremost an application of the Confucian strive for perfection as applied to work. Taiichi Ohno quotes Confucius at the very beginning of his Workplace Management, and it is clear that Confucius’ writings had a deep effect on Ohno. Now, this was a few paragraphs that explain the respect for people principle, so according to your blog post, it should be ignored or considered incomplete. I would really like to hear your take on what aspects you find missing here. Hi Ville – The words “non-zero-sum” (i.e. win-win) is where “respect for people” lies. Your framework is sensible and certainly can be helpful, but the non-zero-sum nature of Lean management means that no definition can represent all circumstances. thank you for sharing your words around striving for perfection. For me, this was a big eye opener and aha moment.. This was a new interpretation of continuous improvement – which in lean thinking classes gets two sentences, with more focus on value stream, flow & pull… but now i see this is really the essence of Lean. Thanks for this article, it is truly insightful! The “respect for people” is keeping me busy thinking and researching for several days now. One thought that I found implicitly contained within several articles, and comments, but never stated explicitly is, that there are two distinct perspectives to it. 1. “respect for people” as in valuing other peoples’ perspectives, skills and individual experiences and keeping up a constant and constructive dialog on an equal footing in order to learn from each other and solve problems together. 2. “respect for people” as anticipating human or individual behaviour and it’s impact on their surroundings and accounting for it in the decisions you make and the systems you create. Thanks for feeding my thoughts! I’d venture to say that, in the three years since you published this post, leaders haven’t seemed to have made much progress in this area. Are you seeing things, I’m not? No, it does not seem that “Respect for People” has gained any real traction since the post was written.